In this post, we will daily update some premium android, iOS and iPad apps which goes free for limited time. [2 November 2014] Today, you will get Panic Train game worth 113 Rs absolutely free. Game supports all major platforms like iOS and android. Along with premium version, you get extra 4000 points. 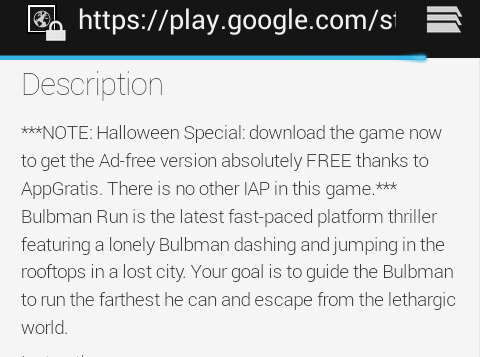 App of the day is “Bulb man Run-Lost City”. It’s premium game for android, iOS worth 122 Rs you will get its ads free full version absolutely free today.